Memorial services for Wanda Undeberg of Badger, MN will be held on Saturday, March 23, 2019 at 2:00 PM at Helgeson Funeral Home in Roseau. Visitation will be one hour prior to the service. Interment will be at a later date. In lieu of flowers, memorials are preferred. 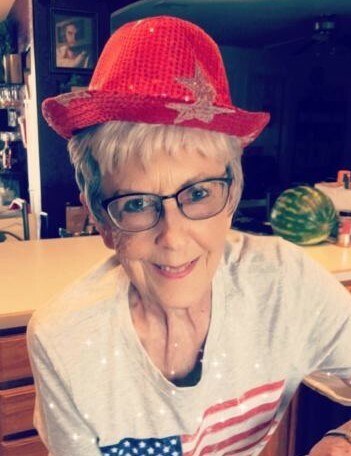 Wanda Undeberg passed away on Sunday, March 17, 2019 at the age of 74 at LifeCare Medical Center in Roseau, Minnesota after complications from a two-year battle with pancreatic cancer. Wanda Muriel Windsnes was born on March 17, 1945 to Peder Windsnes and Lucille (Thomas) Windsnes in Thief River Falls, Minnesota. She lived with her parents and four siblings east of Grygla, Minnesota. In 1956 their family moved to Hoquiam, Washington. Her mother passed away from pancreatic cancer in December 1957. In 1958 Wanda moved back to Minnesota to Thief River Falls, Minnesota and lived with her aunt and uncle, Edna and Otto Rupprecht. She graduated from high school from Thief River Falls in 1963. After graduation, she moved to Badger and began working at the Badger Café as a waitress. During this time, she met Oniel Foster and they got married in July 1964. Oniel and Wanda had four children, Evan, Sheryl, Jody and Jeremy. On July 4, 1998, Wanda married Dwayne Undeberg. Wanda and Dwayne moved to their home east of Halma in 1993. Wanda lived there until after Dwayne passed away in 2016. She then moved to Badger where she has since made her home. The town of Badger was so wonderful at welcoming her back. Over the years, Wanda spent her time as a homemaker, sold Avon, was a cook at the Badger school, and worked a punch-press operator and welder at Polaris. She was an excellent baker. She made the most wonderful homemade bread, cinnamon and caramel rolls, homemade donuts and lefse. She was also an excellent cook. She became quite well known for her potato salad and over the years made it by the gallon for graduation parties. Wanda was an avid reader and would sometimes read a book a day. She also had at least 20 games of Words with Friends going at a time and spent a lot of her day catching up with friends on Facebook. Everyone will remember Wanda for her quick wit and great sense of humor. She was always willing to lend a hand to help friends when they needed it. She was very nurturing and supportive to everyone. Wanda is survived by her four children Evan (Lori) Foster, Sheryl (Mark) Larson, Jody Foster (Joe Kast), and Jeremy (Brandi) Foster. She is survived by 11 grandchildren and six great-grandchildren. She is also survived by her brother David Windsnes and sister-in-law Carol Windsnes, sister Nancy Van Dinter, brother-in-law, Dwight Undeberg and Leslie Foster; sister-in-law, Sharon Undeberg, sister-in-law, Paulette Velie Roseann Lee, Irene Foster, Sonia Foster, and Marie Foster; brother-in-law John Velie, brother-in-law Robin Swanson; and many nieces and nephews. She is preceded in death by her husband Dwayne, her parents, her sisters, Karen Thomas and Helen Herman and infant sister Maxine Windsnes, sister-in-law Colleen Swanson, brothers-in-law Donald Thomas, Dewey Van Dinter, George Foster, Donald Foster and Duke Herman; and granddaughter Kristie Roseen.